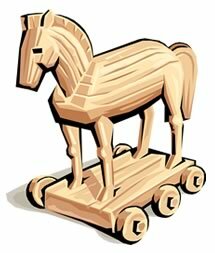 The legendary Trojan horse was a way for the Greeks to bypass Troy's defenses. Researchers at Emory are testing a strategy where cancer cells are induced to shut down their DNA repair genes, making them defenseless against radiation. Researchers at Winship Cancer Institute are developing a technique to remove cancer cells' defenses against radiation. Radiation primarily kills cells by inducing DNA damage, so the aim of the technique is to sensitize cells to radiation by disabling their ability to repair DNA. The technique sneaks RNA molecules into cells that shut down genes needed for DNA repair. The still-experimental method could potentially allow oncologists to enhance the tumor-killing effects of radiation, while using lower doses and reducing damage to healthy tissues. In the laboratory, Wang's team uses modified lentiviruses to introduce the RNA molecules. The same types of viruses have been used in gene therapy research. Wang says her team is now testing whether a small peptide tag can direct RNA to brain tumors instead. The results are published in the March 1, 2012 issue of Cancer Research. The senior author is Ya Wang, MD, PhD, professor of radiation oncology at Emory University School of Medicine and director of the Division of Experimental Radiation Oncology at Winship Cancer Institute. The first author is Zhiming Zheng, now at Shandong University in China. Winship faculty members Jeffrey Olson, MD, Chunhai Hao, MD, PhD and Walter Curran, MD contributed to the research. Zheng and his colleagues focused on two genes, XRCC2 and XRCC4, which encode proteins needed for separate pathways of DNA repair. XRCC2 and XRCC4, in general, are both more active in tumor cells than in healthy cells. In the past, using "RNA interference" techniques to silence a gene was via targeting the coding region only. Here, Wang's team used the RNAi technique to more efficiently knock down the gene via targeting both the coding region (making the RNA unstable) and non-coding region (blocking protein production), thus making brain cancer and lung cancer cells two to three times more sensitive to X-ray radiation. RNAi is a technique that is widespread in the laboratory. It could be useful clinically as well because of the targeted ability to silence particular genes, but is still experimental for use in humans. Andrew Fire and Craig Mello received the 2006 Nobel Prize in Medicine for the discovery that short pieces of RNA, when introduced into cells, can silence a stretch of genetic code. Artificially introduced RNA hijacks machinery inside the cell that the cell naturally uses for regulation. Wang adds that her team's tactic of combining two ways to knock a gene down may be useful in the laboratory, among a wide range of fields of biology. "It may be particularly suited to suppressing genes that are difficult to approach by simpler methods,” she says. Wang's research is supported by the National Institutes of Health and the National Aeronautics and Space Administration. Z. Zheng, W.L. Ng, X. Zhang, J.J. Olson, C. Hao, W.J. Curran and Y. Wang. RNA-mediated targeting of noncoding and coding sequences in DNA repair gene messages efficiently radiosensitizes human tumor cells. Cancer Res 72, 1221-1228 (2012).